The bank prime loan rate remained unchanged during the first half of October, at 3.25 percent. The showdown in Washington over the federal budget and the debt ceiling has the potential to have a profound effect on interest rates, but the lack of change in credit card rates in early October was indicative of the fact that for the time being at least, uncertainty is the prevailing outlook. In other words, the situation is not yet clear enough for credit card companies to have a good basis for raising or lowering credit card rates. Not only is the outcome of the fiscal debate still uncertain, but there is an argument to be made both ways about the impact this crisis will have on credit card rates. On the one hand, shutting down the government has an immediate, dampening effect on the economy. To the extent that weaker economic demand often leads to low interest rates, a slowdown could cause rates to fall. On the other hand, if the economy gets bad enough, it will lower the credit standing of many Americans, which would tend to cause lenders -- including credit card companies -- to charge higher interest rates. Credit quality concerns could be greatly magnified if the U.S. defaults on any of its debts, since the resulting chain reaction would be likely to tighten liquidity around the world. For now though, credit card rates remain unchanged pending the outcome of the budget debate. Under the circumstances though, that lack of change should not be mistaken for calm. The prevailing trend for consumer credit cards this year has been toward higher rates, but that trend took a break in the first half of October. Overall, consumer credit card rates have risen by 38 basis points so far this year -- a significant climb, but mild compared to the increase in other types of interest rates, such as those on mortgages and Treasury bonds. The rise in consumer credit card rates has been split fairly evenly between rewards and non-rewards credit cards. Rates on rewards credit cards rose by 39 basis points so far in 2013 while rates on non-rewards credit cards rose by 37 basis points. The difference in rates for the two types of cards now stands at 2.43 percent. This rate differential is one measure of the additional cost of rewards programs, though the actual cost incurred by consumers depends on the balances they carry on their credit cards -- consumers who pay their credit card bills in full every month are able to enjoy the benefits of rewards programs for free. Student credit card rates remained unchanged for the second consecutive survey. Unlike consumer credit card rates, student credit card rates have declined overall so far in 2013, with a net decline of 19 basis points. 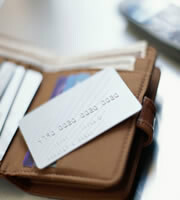 Business credit card rates have remained unchanged for six months now. In fact, while consumer credit card rates have risen and student credit card rates have fallen so far in 2013, business credit cards have been a model of stability. Business non-rewards credit card rates have not changed at all so far this year, while business rewards credit card rates have fallen by a single basis point. With no change in consumer credit card rates during the first half of October, the difference between rates for consumers with excellent credit and the overall average remained unchanged, at 4.00 percent. 0 Responses to "Washington drama doesn't faze credit card rates"